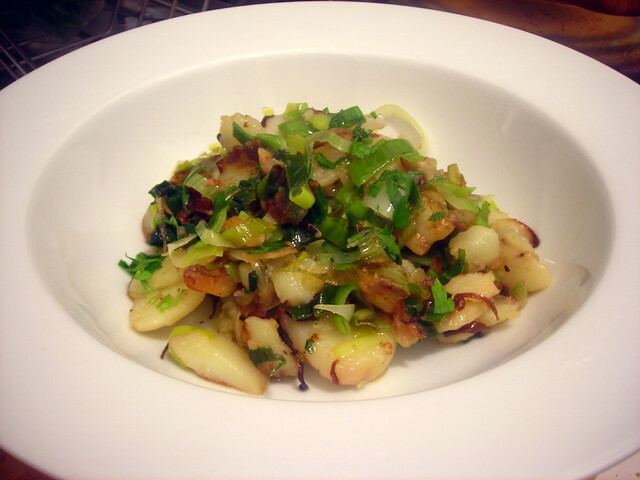 This is a winter version of Fagiolini e patate, one that substitutes leeks for green beans in the linked recipe. If you don’t have leeks, you can use other winter greens such as chicory, escarole, kale, chard or watercress. Another version that I’m especially fond of contains a variety of wild mushrooms — shiitake mushrooms, cremini mushrooms and oyster mushrooms are all wonderful and delicious alternatives. One food resolution I have for 2013 is to try to reduce the amount of kitchen waste that I regularly throw out, especially produce. I’ve always found it silly (not to mention wasteful) that recipes often call for only the white and light green parts of leeks. The dark green parts are edible too. I love them in preparations such as insalata di ceci e porri (chickpea and leek salad), gratinéed leeks, or as a base for vegetable stock. In fact, much of what you may think of as “trash” can be re-purposed in new, exciting and delicious ways. Warm olive oil in a large skillet over medium heat along with the shallots and garlic. Fry the garlic until it begins to color, about 1 minute, but do not let it brown. Add the potatoes and leeks, using a wooden spoon or spatula to mash the potatoes slightly. Sauté until the potatoes begin to crisp up and turn golden brown, about 6 to 8 minutes. Taste for salt and pepper. Drizzle with extra-virgin olive oil, sprinkle with white wine vinegar (if desired) and Italian parsley. Serve at once. 18 Feb	This entry was published on February 18, 2013 at 4:42 am. It’s filed under cooking, food, food photography, Gluten-Free, Italian food, recipe, vegan, vegetarian, winter and tagged dinner, food photography, gluten-free, Italian food, leeks, potatoes, vegan, winter. Bookmark the permalink. Follow any comments here with the RSS feed for this post. Adding a veg to potatoes is great. Looks fantastic! it’s funny though, because potatoes ARE vegetables. we just don’t think of them as that. More YummY goodness from Stash & Simple Kitchen Seasons. you’re too kind, Jueseppi. thank you.